Fenech Adami recalled that during the previous week, both parties had approved their list of candidates and their electoral programmes revealing the stark difference between the two parties. The list of MLP candidates and the districts being contested reflected the current sharp divisions within the Labour Party, whereas the PN list reflected a team that had been tirelessly working together for months on end. Yet the greatest contrast between the two parties was in their electoral programme. 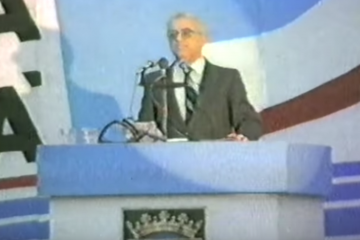 The PN programme was the fruit of the hundreds of dialogue sessions that the PN leadership had organised with different sectors of the population. The PN programme was creatively innovative inspired by a vibrant trust in the abilities of the Maltese people. 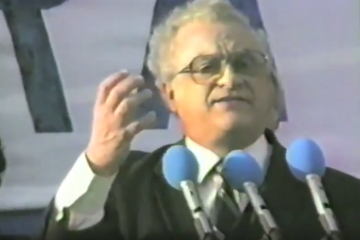 The Socialists’ programme was clearly a forced, hackneyed exercise, with a distorted image the Malta’s political history, and absolutely nothing that resembled a vision for Malta’s future. The PN leader sharply criticised Labour Leader Karmenu Mifsud Bonnici, who accused the Nationalist Party and its leadership of sowing the seeds of hatred and division. 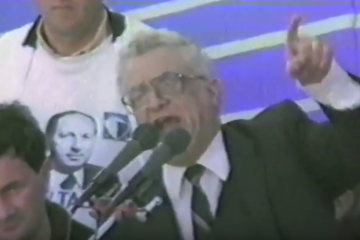 The Socialist Premier was clearly trying to pass on to the Nationalist Party that which has been the hallmark of the Labour Party for the past sixteen years in office, with endless incidents of violence, corruption, abuse and discrimination. 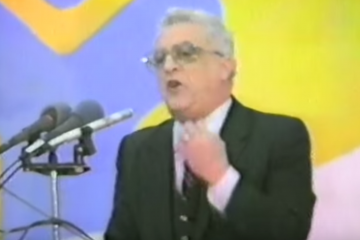 Fenech Adami said that in the past days the MLP Leader began claiming that his Party was the sole representative of the working class and as such had the sacrosanct right to govern. It was clear that Karmenu Mifsud Bonnici was living in a Socialist pipedream and in denial, he added. Malta’s workers were solidly behind the Nationalist Party. During sixteen years of Socialist abuse, when workers’ rights were heavily trampled upon, it was only the Nationalist Party that shielded Malta’s workers from further abuse. In less than a month, Malta’s electorate will be called to cast its vote, said Fenech Adami. A renewed majority for the Nationalist Party will pave the way for a return to social and economic progress in an environment where democracy and rule of law prevailed. 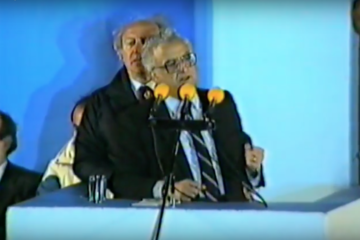 This mass meeting saw a very enthusiastic crowd just four weeks before what was arguably the most crucial election in Maltese political history. Campaigning had to then stop for a few days because of Easter which in 1987 fell on the 19th April. 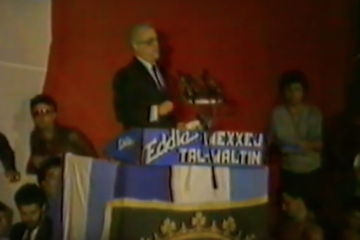 Despite years of political violence and lack of democracy, the pre-electoral meetings of 1987 were characterised by very large and impressively enthusiastic crowds. A huge welcome used to be given to Eddie Fenech Adami upon his arrival. 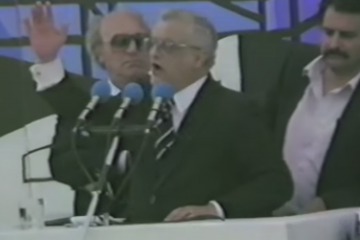 The singing of the campaign song – Nationalists, Olè – was a particularly exuberant moment. 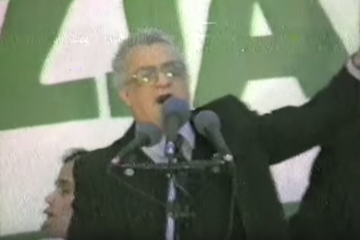 Chanting by the crowds used to interrupt Fenech Adami’s speeches as they began and throughout. Mass meetings had thus become an active experience for those attending, not just a listening exercise; and this happened from the departure on private buses from all localities until they arrived back. 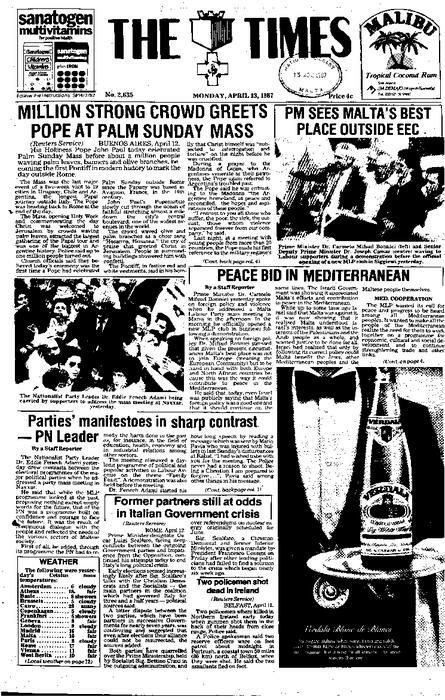 The impact of the mass meetings was also transmitted by the few independent media of the time: the Nationalist Party’s own papers, the Times and ‘clandestine’ transmissions from Sicily. 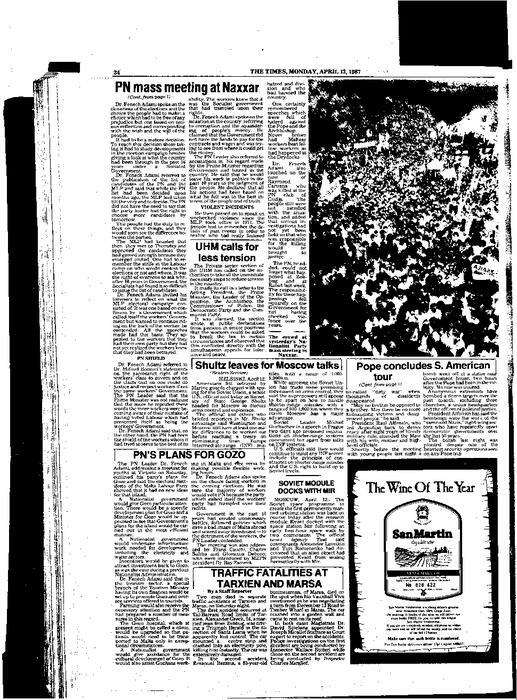 The way In-Nazzjon (which could not use this word in its masthead because of a law which was then repealed after the election) used to present the photos of the massed crowds had become an art form in itself. Dan il-mass meeting sar f’entużjażmu kbir hekk kif kien għad jonqos biss erba’ ġimgħat għal dik li wieħed jista’ jargumenta li kienet l-aktar elezzjoni kruċjali fl-istorja politika Maltija. 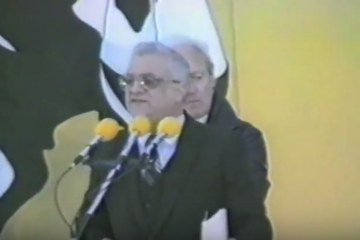 Il-Ħadd ta’ wara kellha ssir waqfa fil-kampanja elettorali għall-Għid li fl-1987 ħabat fid-19 t’April. 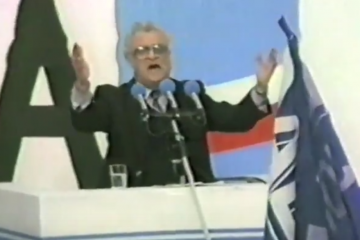 Minkejja snin sħaħ ta’ vjolenza politika u nuqqas ta’ demokrazija, l-entużjażmu fil-mass meetings ta’ qabel l-elezzjoni tal-1987 kien ikun impressjonanti. 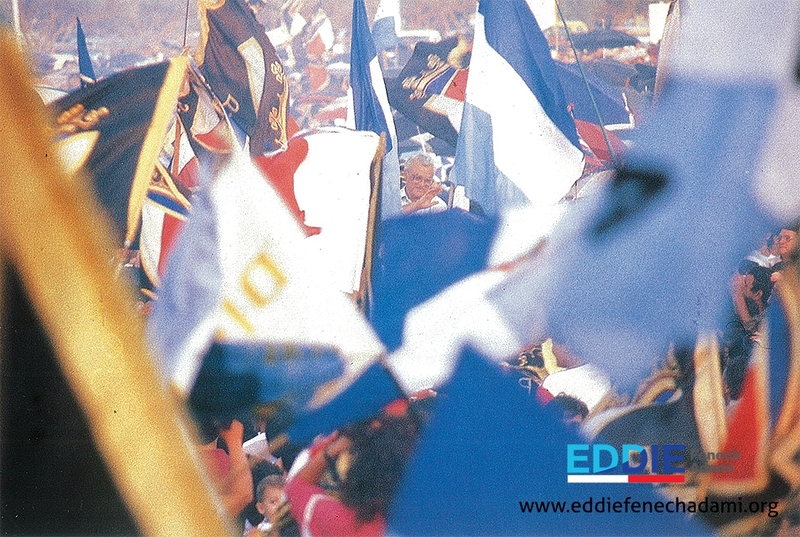 Il-merħba li kien jingħata Eddie Fenech Adami hu u dieħel kienet tkun kbira ħafna. Id-daqq tal-kanzunetta popolari magħmula apposta għal dik l-elezzjoni – Olè Nazzjonalisti – kien iżid mal-ħeġġa. Il-kant tal-folla kien jinterrompi l-bidu u ħafna partijiet tad-diskors ta’ Eddie Fenech Adami. Il-mass meetings b’hekk saru esperjenza attiva għall-folla u mhux biss okkażjoni ta’ smigħ; u dan sa mit-tluq tan-nies mil-lokalitajiet bil-privates sal-wasla tagħhom lura. L-impatt tal-mass meetings kien jiġi wkoll bir-rappurtaġġ tagħhom fil-ftit midja indipendenti ta’ dak iż-żmien: il-gazzetti tal-Partit Nazzjonalista stess, it-Times u xandir ‘klandestin’ minn Sqallija. Il-mod kif il-gazzetta In-Nazzjon (li ma setgħetx tuża l-kelma ‘Nazzjon’ b’liġi li mbagħad tneħħiet l-għada tal-elezzjoni) kienet tippreżenta r-ritratt tal-folol fil-mass meetings kien sar arti fih innifsu. Qabel nibda xtaqt naqralkom messaġġ qasir li ġejt mitlub li naqra. “Nixtieq li llum kont preżenti magħkom fil-meeting. Il-pulizija qatt ma kellhom għalfejn jisparaw. Bħala nisrani jien lest li naħfer. Nappella liż-żgħażagħ biex jagħmlu kuraġġ f’din il-mixja tagħna għar-rebħa tas-sewwa tad-demokrazija tal-ġustizzja. Nirringrazzja minn qalbi lil kull min b’xi mod jew ieħor xtaqli fejqan ta’ malajr. Kuraġġ” Iffirmata Mario Pavia. Baqa’ biss erba’ ġimgħat. Anzi bħal-lum erba’ ġimgħat dal-ħin inkunu aktarx nafu diġà r-riżultat tal-elezzjoni. Iż-żmien tal-għażla għalhekk mhux biss qorob imma wasal fl-aħħar tiegħu. L-għażla li aħna rriduha tkun għażla maħsubha. L-għażla li aħna rridu li tkun tikkorrispondi għax-xewqa, għall-volontà tal-poplu tagħna. L-għażla li ma rriduhiex frott ta’ sentiment ta’ preġudizzji. L-għażla li trid tkun għażla maħusba, id-deċiżjoni matura ta’ kull wieħed u waħda minnkom. Aħna qed niltaqgħu biex tagħmlu dan il-ġudizzji tagħkom. Niltaqgħu biex ngħinukom biex, fis-silenzju tal-kamra tal-vot bħall-bieraħ erba’ ġimgħat oħra, tagħmlu l-għażla t-tajba. Biex tagħmlu din l-għażla mhux biss tridu tiftakru dak li għadda minnu l-pajjiż tul is-sittax-il sena li għaddew, mhux biss tridu tħarsu lejn il-programmi elettorali, imma ssegwu kontinwament l-iżvolgiment ta’ din il-kampanja elettorali. Jien nistedinkom taħsbu fuq tliet ħwejjeġ li ġraw tul din il-ġimgħa li għaddiet. Il-Kunsill Ġenerali tal-Partit Nazzjonalista ltaqa’ nhar l-Erbgħa u approva l-programm elettorali tiegħu u l-kandidati għal din l-elezzjoni. Il-partit l-ieħor għamel żewġ konferenzi ġenerali. Għamel konferenza ġenerali nhar il-Ħamis biex dakinhar suppost japprovaw il-kandidati għall-elezzjoni. Ngħid suppost, għax skond r-rapporti tal-konferenza ġenerali, il-kap tagħhom żamm id-dritt li jżid kandidati oħra minn nhar il-Ħamis sa għada. Għax għada jagħlqu n-nominazzjonijiet tal-elezzjoni. Ilbieraħ iltaqgħu l-konferenza ġenerali tal-partit tagħhom flimkien mal-General Workers Union biex approvaw il-programm. Tajjeb li taħsbu ftit fuq dawn l-avvenimenti tal-ġimgħa li għaddiet. jien nistedinkom taqraw il-programm elettorali tal-Partit Nazzjonalista li llum issibuh ppubblikat kollu f’il-mument. Meta taqrah tinduna li dak programm mibni fuq il-fiduċja. Programm li meta taqrah tinduna li l-Partit Nazzjonalista qed jipproponi numru ta’ affarijiet u dettalji li huma l-frott ta’ djalogu li ma qata’ qatt. Kien djalogu mal-poplu tagħna kollu. Djalogu mas-soċjetà Maltija kollha kemm hi. Tindunaw malajr li l-programm huwa frott ta’ dan id-djalogu, ta’ dan il-kuntatt kontinwu mal-poplu tagħna u hemm rifless fih x’inhuma verament il-bżonnijiet fid-diversi setturi tas-soċjetà Maltija. Taqra dak il-programm u tikkonferma b’fiduċja li dan partit lest, mimli b’ideat, jaf x’għandu jagħmel biex lil pajjiżna jerġa’ jpoġġih fuq it-triq tal-progress. Programm li huwa mimli fiduċja,li juri l-kuraġġ. Mhux il-kuraġġ tiegħi u sħabi imma l-kuraġġ u d-determinazzjoni tagħkom, li għal darb’oħra, u nirringrazzjakom minn qalbi ġejtu f’din il-folla li ma nsibx aġġettivi aktar ġodda biex niddeskriviha. Aħna morna wkoll quddiem il-Kunsill Ġenerali tagħna b’lista ta’ kandidati. Lista li la lestejnieha lejliet il-Kunsill Ġenerali, lanqas kellna bżonn ngħidu li l-kap tal-partit għandu d-dritt jagħżel kandidati oħra sa nhar it-Tnejn. Il-kandidati fuq Il-lista ma ġewx magħżula nhar l-Erbgħa li għaddew imma ilhom ix-xhur u s-snin jaħdmu fostkom. Jien ċert li fostkom illejla hawn mijiet, jekk mhux eluf, li llum qegħdin mal-Partit Nazzjonalista frott tal-ħidma tal-kandidati tagħna li ilhom ix-xhur u s-snin lesti għall-mument li fih il-poplu jiddetermina min ser jigverna dan il-pajjiż. Għalhekk, meta taħsbu u tagħmlu l-paragun, kif inhu d-dover tagħkom, malajr taraw id-differenzi. nhar il-Ħamis, meta ltaqgħu u approvaw il-kandidati ħarġu jgħajtu li ssaħħu għax ħarġu magħquda. Aħna konna ilna nisimgħu b’din il-firda, b’din il-gwerrra intestina, It-Taljani jgħidulha faida, ġlied kbir bejniethom dwar min ser ikun kandidat hawn u le. Dakinhar marru għall-konferenza ġenerali qalulna lli kien hemm entużjażmu kbir għax il-partit ma nqasamx. Għax il-partit baqa’ sħiħ lejliet l-elezzjoni. Jiena ngħid li hu dmir taghħna, dmir tal-poplu Malti kollu, li jipprova jifhem x’kien hemm li qiegħed jaqsamhom. Għaliex, wara sittax-il sena fil-gvern, sabuha tant diffiċli biex joħorġu lista tal-kandidati tagħhom? Għaliex, meta dawn ġebbdu sal-aħħar ġurnata biex isejħu l-elezzjoni, kellhom jistennew sal-aħħar ġurnata biex jaraw min ser ikun jew mhux ser ikun kandidat fuq it-tieni distrett? Lilna ma jinteressaniex min huma l-kandidati tagħhom. Imma, meta nafu x-xniehat li kien hawn, llum konfermati b’dak li ġara u b’dak li qalu huma stess li kien hemm din il-firda bejniethom, biex jagħmel l-għażla maħsuba li tkellimt fuqha, il-poplu Malti jrid jaħseb ukoll dwar x’inhi r-raġuni ta’ din il-firda li kellhom u għad għandhom bejniethom. Meta wieħed jara dak li qalu w jaqra dak li nkiteb fil-gazzetti tagħhom, jieħu l-impressjoni li donnu xi ħadd minnhom kellu jagħmel pjaċir lill-Perit Mintoff biex hu joħroġ għat-tieni distrett. Forsi jgħid bil-maqlub, li kien il-Perit Mintoff li ried jagħmlilhom pjaċir u jerġa’ joħroġ fuq it-tieni distrett, b’kondizzjonjiet li għamel hu. Kondizzjonjiet li kellhom jiġu aċċettati. U dak il-Ministru li kien ilu jġib ir-riklami paġna sħiħa li hu kandidat għat-tieni distrett? Dak il-Ministru, qalulna, issa iddeċieda li jagħmel sagrifiċċju personali fl-interess tal-partit tagħhom u ma joħroġx għal dak id-distrett. Vermaent l-poplu Malti, partikolarment dawk li sal-lum kien għad għandhom fiduċja fil-partit l-ieħor, għandu jistaqsi x’inhu jiġri fil-partit tagħhom. Għamlu farsa! Għamlu kummiedja! Il-kap tagħhom jirringrazzja lil Lorry Sant tal-ġenerożità tas-sagrifiċċju kbir tiegħu u l-Perit Mintoff jgħid li hu kien qed joġġezzjona għall-kandidatura ta’ Lorry Sant flimkien miegħu, mhux għax m’għandux fiduċja fl-integrità personali ta’ dak il-Ministru. Il-poplu Malti jisma’ dan id-diskors u jgħid: Dawn x’kummiedji huma? Dawn x’kummiedja huma fi ħdan partit li aħna wkoll rriduh jibqa’ partit kbir, partit qawwi. Aħna irriduh jmur fl-oppożizzjoini biex jissaħħaħ, jitnaddaf mbagħad ’l quddiem jerġa’ jkollhom iċ-ċans li jkunu ta’ ġid għall-poplu tagħna. Aħna nieħdu pjaċir li jingħaqdu bejniethom għax aħna żgur li kapaċi nirbħulhom ilkoll flimkien, m’għandniex bżonn li jinqasmu bejniethom. 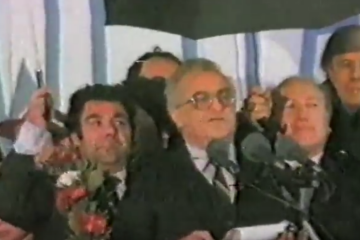 Aħna m’għandniex dubju mir-rebħa tagħna, għax lill-Perit Mintoff diġà rbaħnielu meta hu kien kap tal-partit fl-1981. 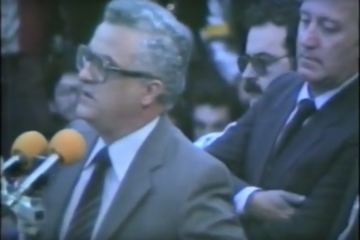 Fl-1981 rebaħ il-Partit Nazzjonalista għax fid-demokrazija min ikollu l-akbar appoġġ tal-poplu, min ikollu l-maġġoranza assoluta tal-poplu warajh, jissejjaħ rebbieħ. U r-rebbieħ fl-aħħar elezzjoni kien il-Partit Nazzjonalista. Jekk irbaħna lil Mintoff bil-kariżma tiegħu, jekk irbaħna lil Mintoff wara snin li kien kap ta’ dak il-partit, lil Karmenu Mifsud Bonnici ser inkaxkruh! Nerġa’nitlobkom taħsbu għax l-enfażi tagħna hija li int taħseb. Araw daqsxejn din il-kampanja elettorali tagħhom fiex tikkonsisti. Hi kampanja elettorali li għandha riċetta waħda biss. Riċetta waħda b’dożi kultant differenti imma r-riċetta hija waħda. Hi kawlata ta’ gvern imsejjaħ tal-ħaddiema li jrid jibqa’ jirkeb fuq dahar il-ħaddiema Maltin. Kull diskors li jagħmlu għandu dan bħala l-bażi tiegħu. Din hija r-riċetta: Appell lill-ħaddiema u jgħidulhom intom il-ħaddiema għandkom il-partit tagħkom! Dawn għadhom ma ntenbħux li l-ħaddiema Maltin issa ilhom li ndunaw b’dan it-tradiment. Imma kultant ibiddlu d-doża. Hekk għamel Karmenu Mifsud Bonnici lbieraħ. Ilbieraħ u fil-konferenza ġenerali, għamel l-appell għall-għaqda fost il-ħaddiema. Dan mhux jinduna li aktar ma toqrob l-elezzjoni, aktar ma jgħid id-diskors bħal dan, aktar ħaddiema qed jintebħu kemm għamlu żball meta vvutaw lill-partit l-ieħor għax ippreżenta ruħu bħala partit u gvern tal-ħaddiema. Iktar ma jgħaddi ż-żmien, u ma kull ġurnata li tgħaddi, iktar ħaddiema qed jintebħu kemm hija gidba li tgħid li gvern bħal dan li għandna, li jissejjaħ tal-ħaddiema, huwa biss jista’ jagħmel ġustizzja u jirrispetta lill-ħaddiema. Il-ħaddiema dan jafuh għax għandhom l-esperjenza qarsa ta’ x’ifisser dan il-Gvern li tela’ bl-għajta li jirrappreżenta l-klassi tal-ħaddiema. Il-ħaddiema Maltin intebħu b’dan u ntebħu bil-qerq li dan il-Gvern ilu jwettaq tul tant snin. Fil-fatt il-Partit Nazzjonalista issa ilu li laqa’ l-isfida li juri l-gidba li l-oħrajn għandhom xi dritt speċjali jirrappreżentaw lill-ħaddiema. Il-Partit Nazzjonalista issa ilu li laqa’ l-isfida li juri li f’pajjiżna fiż-żminijiet li qed ngħixu, il-veru difensur tal-ħaddiem Malti hu l-Partit Nazzjonalista. Jien stess, meta sirt kap tal-Partit bħall-bieraħ għaxar snin ilu, fl-ewwel diskors li għamilt kont għidt li hemm bżonn naħdmu biex ineħħu l-preġudizzji kontra l-Partit. Kont għidt li hemm bżonn naħdmu biex nuru lill-poplu tagħna l-ewwel nett li l-partit l-ieħor għex gidba meta qal li hu għandu l-interessi tal-ħaddiema għal qalbu. Għidt ukoll li hemm bżonn ineħħu l-preġudizzji kontra l-Partit Nazzjonalista, għax il-fatti juri li kemm fl-imghħoddu u fil-preżent il-Partit Nazzjonalista dejjem kellu qalbu mal-ħaddiema Maltin u Għawdxin. Dan għamilnieh, irnexxielna nagħmluh, tul l-għaxar snin u aktar li għaddew. Veru li għad baqa’ min għadu ma fetaħx moħħu biżżejjed. Veru li hawn min għadu jibla’ l-qerq, l-ingann, tal-partit l-ieħor. Imma m’hemmx dubju, u l-prova kienet l-elezzjoni li għaddiet u l-prova ser tkun l-elezzjoni li ġejja, li llum dak il-preġudizzju kontra l-Partit irbaħnieh u, b’wiċċna minn quddiem, ngħidu li aħna vermanet il-partit tal-poplu kollu. Aħna verament il-partit li għandna għal qalbna l-interessi tal-ħaddiema. Dan huma jafuh. Tant jafuh li din il-ġimgħa qassmu leaflet ieħor. Leaflet li fil-paġna tan-nofs tiegħu għandu ritratt ta’ numru ta’ ħaddiema bil-boilersuit f’idejhom kollha bil-gazzetta in-Nazzjon Tagħna. Fost dawn mbagħad hemm wieħed li qed iqattagħha u oħrajn qed iħarsu lejn il-gazzetta qiegħda taqbad. Dan ir-ritratt hu l-prova li l-vuċi tagħna qed tasal għand il-ħaddiema fil-postijiet tax-xogħol, fil-fabbriki, fit-Tarzna, kullimkien. Dan ir-ritratt ċertament hu ppużat għall-parti tal-qtugħ u tqattiegħ, imma juri li realment l-ħaddiema huma anzjużi biex jisimgħu l-kelma tal-Partit Nazzjonalista, għax kien il-Partit Nazzjonalista li f’dawn is-sittax-il sena kien it-tarka biex jiddefendi d-drittijiet tal-ħaddiema Maltin kollha mingħajr ebda distinzjoni. Aħna f’dawn l-aħħar għaxar snin servejna lill-ħaddiema bl-aħjar mod li stajna. Ma hemmx dubju li l-ħaddiema Maltin dan fehmuh. Fehmu li kien dan il-Gvern li kasbar id-drittijiet tagħhom. Fehmu li dan il-Gvern mhux verament gvern tagħhom imma gvern ta’ klikka. Gvern ta’ klikka li stgħaniet minn fuq dahar il-ħaddiem Malti. Il-ħaddiema Maltin jafu li frott ix-xogħol ta’ dan il-Gvern jistgħu jarawh b’għajnejhom. Frott ix-xogħol ta’ dan il-Gvern kienet il-korruzzjoni. Frott ix-xogħol ta’ dan il-Gvern kien it-tberbieq ta’ miljuni ta’ flus il-poplu tagħna. Frott ix-xogħol ta’ dan il-Gvern huwa l-falliment li jinsab fih il-pajjiż illum. Jien ngħidilkom li dan il-Gvern diġa’ m’għandux biex iħallas għall-kuntratti li qed jagħmel. M’għandux minn fejn iħallas il-pagi u qed jara minn fejn jiddejjen biex ikollu l-flus biex iħallas il-pagi lin-nies tiegħu stess. Il-frott tax-xogħol ta’ dan il-Gvern huma l-inġustizzji ma’ kull qasam tal-poplu tagħna. Il-frott tax-xogħol ta’ dan il-Gvern huwa n-nuqqas ta’ xogħol li qed jifni lil dan il-pajjiż. Il-frott tax-xogħol ta’ dan il-Gvern huwa l-ġlied ma kulħadd. M’hawnx settur tal-poplu tagħna li dan il-Gvern xi darba f’dawn is-sittax-il sena, almenu darba, ma daħalx f’konfront miegħu. Ma daħalx fi ġlieda miegħu. Din il-ġimgħa, pereżempju, ġie jkellimni wieħed fuq it-Taxis. Forsi dan settur li aħna stess ma tajniehx importanza għax fih numru ta’ nies żgħir. Hu spjegali l-inkwiet li għaddew minnu tat-taxis tul is-snin li għaddew. Kif daħqu bihom. Taparsi jgħidulhom ser jirranġawlhom l-affarijiet. Taparsi bl-appuntamenti ma’ Ministru jew m’ieħor mbagħad ma jsir xejn. Dawn numru limitat ta’ ħaddiema Maltin li sfaw traduti wkoll minn dan il-Gvern. Sfaw traduti għax daħqu bihom. Sfaw traduti għaliex lil uħud minnhom faqruhom. Il-kampanja elettorali ta’ Karmenu Mifsud Bonnici hi waħda ta’ karba kontinwa biex jgħid lill-ħaddiema li hu u sħabu biss għandhom id-dritt jirrappreżentawhom. Aħna ngħidu li Gvern Malti li jkollu l-appoġġ tal-maġġoranza tal-poplu, bilfors irid ikollu l-maġġoranza tal-ħaddiema warajh. Hekk se jerġa’ jkollna fl-elezzjon li ġejja! Jekk inħarsu lejn l-istorja politika ta’ pajjiżna mill-aħħar gwerra ’l hawn, naraw kif fl-ewwel l-elezzjoni huma bdew bi kwazi sittin fil-mija tal-poplu warajhom u aħna bdejna bi tmintax fil-mija. Minn hem il-quddiem bqajna telgħin, kull elezzjoni nżidu. 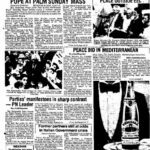 Kull elezzjoni nżidu sakemm fl-1981 qbiża l-wieħed u ħamsin fil-mija u din id-darba mhux il-wieħed u ħamsin fil-mija ser inġibu imma jien żgur li l-maġġoranza tagħna sejra tkun sostanzjalment akbar. F’diskors li għamel fil-Konferenza Ġenerali lbieraħ dan għoġbu,jiftaħ attakk personali fuqi. Dan qal li jekk fil-pajjiż hawn il-firda, il-mibegħda u l-ħdura, dan hu tort tiegħi. Qal li kont il-perċimess biex noħloqhom. Jien inħalli l-ġudizzju fuqi f’idejkom. Jien quddiemkom u quddiem Alla nistqarr li tul dawn l-għaxar snin, u kemm ilni fil-politika, dejjem ppruvajt nagħmel dak li hu fl-aħjar interess tal-poplu tagħna, dak li hu fl-aħjar interess tas-sewwa għal pajjiżna. Inħalli l-ġudizzji fuqi f’idejkom u ċertament bħal-lum erba’ ġimgħat intkom tkunu tajtu ġudizzju fuqi wkoll bil-vot li intom sejrin tagħtu. Imma tajjeb li taraw u tippruvaw tiftakru d-dettalji u tifhmu b’moħħħkom mhux b’li ngħid jien biss. Min fil-pajjiż ġab il-firda? Min għamel tant ħsara li pajjiżna? Nfakkarkom xi ftit jien. Mhux liż-żgħażagħ, għax ma tiftakrux l-elezzjoni ta’ sittax-il sena ilu. Imma, dawk li dakinhar kienu diġà kbar jiftakru. Jiftakru r-riżultat tal-elezzjoni u kif malli ħareġ ir-riżultat tal-elezzjoni bdiet tinxtered il-mibegħda. Bdew l-insulti. Bdew bid-dimostrazzjonijiet imsejħa spontanji li kienu kollha dimostrazzjonijiet li biex ibeżżgħu lilna. Kien mingħalihom li lilna, li dakinhar tlifna l-elezzjoni bi ftit, kienu se jdaħħluna f’qoxortna u jsoddulna ħalqna. 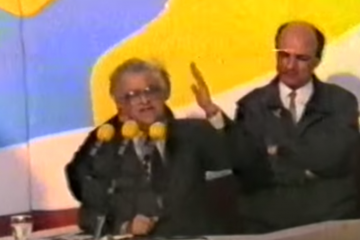 Ftakru l-insulti u d-dispjaċiri kbar li sofra il-Kap tagħna George Borg Olivier malli ħadu l-Gvern f’idejhom. Il-mibegħda bdiet mill-bidu nett u beda wkoll l-użu tal-vjolenza, vjolenza li kważi ma ġiet imrażżna xejnmatul dawnis-snin kollha. Vjolenza li bdiet mill-bidu fid-dimostrazzjonijiet ta’ kuljum quddiem il-Parlament. Ġurnata minnhom il-karozzi taghna li konna fil-Parlament, dak iż-żmien konna nħalluhom ħdejn is-Suq tal-Belt, kważi kollha kienu mfarrkin. Kien ġie l-Perit Mintoff fil-Parlament u qal jrid jagħtihom lezzjoni lil dawk li kissru il-karozzi. Qal nagħtihom lezzjoni billi nħallsu għalihom aħna l-Gvern għall-ħsara li għamlulkom biex dawk jindunaw li meta jkissru jkun il-Gvern stess li qed ibagħti! Ammissjoni akbar ta’ minn fejn kienet qed tiġi dik tal-vjolenza ma kellux bżonn il-poplu dak iż-żmien. Ftakru kif għal numru ta’ snin ma stajniex immorru l-Belt u nagħmlu dimostrazzjoni fil-kwiet u fil-paċi u fil-ferħ. Kienu jħalluhom apposta jisfrattawlna d-dimostrazzjonijiet u jsawtuna. 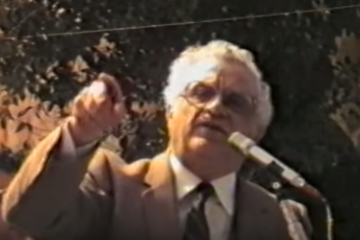 Kif sawtu lil Guido Demarco li qieghed hdejja. Kif sawtu lil tant minkom. Kif sawtu wkoll lil deputati oħra. Ftakru kif il-vjolenza ma ġietx imrażżna. Għaliex kif tista’ tgħid li l-vjolenza ġiet imrażżna meta aktar minn mitt darba attakkawlna l-każini tagħna? Każini li spiċċaw maħruqa wħud minnhom aktar minn darba. U tista’ tgħid li kważi qatt ma ġie mħarrek xi ħadd għax kien għamel l-użu tal-vjolenza. 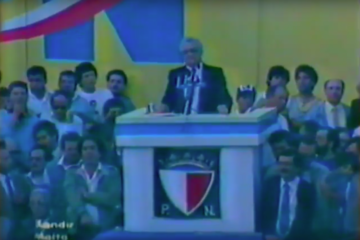 Ftakru fl-1984, ftit inqas minn tliet snin ilu, meta f’temp ta’ tliet xhur, bejn Settembru u Diċembru, tpoġġew għoxrin bomba wara l-bibien tan-nies, wara ħames każini tagħna, mad-dar tal-Arċisqof fl-Imdina, mad-dar ta’ amabaxxati f’pajjiżna. Ftakruhom dawn l-affarijiet għax hemm bżonn li l-ġudizzju tagħkom, l-għażla tagħkom, tkun għażla, nerġa’ ngħid, maħsuba. U dan għandu l-wiċċ jgħid li jien żrajt il-firda u l-mibegħda meta l-fatti juru li kienu huma fil-gvern li kontinwament, flok ma fittxew li jgħaqqdu lill-poplu tagħna, għamlu minn kollox biex firduh. Komplu ftakru l-mibegħda u l-ħdura li esprimew mhux kontra tiegħi, mhux kontra sħabi, mhux biss kontra l-Partit Nazzjonalista. Ftakru fid-diskorsi ta’ Karmenu Mifsud Bonnici kontra l-Papa. Ftakru fid-diskorsi ta’ Karmenu Mifsud Bonnici mimlijien ħdura u mibegħda kontra l-Arċisqof. Ftakruhom biex tgħidulu min ġab il-firda min ġab il-mibegħda f’dan il-pajjiż. Dan għoġbu jattakka lili u jgħid li jien żrajt il-firda u l-mibegħda. X’għamel hu meta mexxa folla biex kissru l-Kurja tal-Arċisqof biex attakkaw il-qrati? Dan jgħid li jien żrajt il-mibegħda. Għaliex ma jarax x’għamel meta għamel tant diskorsi ta’ theddid kontra l-qrati tagħna? Għaliex ma jarax li sa fil-Parlament mar jhedded lill-qrati tagħna b’mozzjoni u sa żamm il-proċess tal-qrati tagħna meta kien hemm u għad hemm il-kawżi kontra l-gvern tiegħu? Il-kawżi tal-Arċisqof kontra tiegħu fuq l-iskejjel. Il-kawżi tal-Arċisqof kontra tiegħu għax hu jrid jaħtaf il-proprjetà tal-Knisja f’Malta u jindaħal fid-drittjiet u d-dmirijiet tal-Knisja f’pajjiżna. Dan jgħid li jien żrajt il-firda? 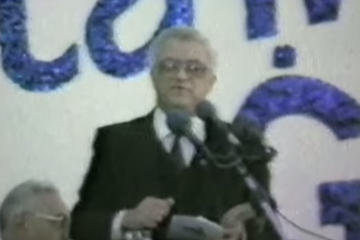 Għax ma jiftakarx li l-Gvern tiegħu, fl-1981, keċċa lil numru ta’ sorijiet minn Malta għal raġuni li kien ilhom jaħdmu f’Malta għal snin twal jagħtu servizz fi sptar u l-Gvern ma ridhomx ikomplu hemmhekk! Bagħtuhom ‘il barra qishom ħallelin, qishom delinkwenti. U dan irid jakkuża lili li jien ġibt il-firda, li jien ġibt il-mibegħda! Għaliex ma jiftakarx il-mibegħda li ġiebu fost il-ħadiema! F’Malta qatt ma konna rajna qabel ħaddiema jsawtu lill-ħaddiema. Imma hekk għamlu dawk li jkunu madwaru fit-Tarzna meta sawtu lill-ħaddiema sħabhom. Jgħid li jien ġibt il-firda fil-pajjiż. Għax ma jarax il-protezzjoni li l-Gvern tiegħu u hu stess qiegħed jagħti lil nies kriminali li posthom huwa l-ħabs u mhux fuq it-trakkijiet meta jkun għaddej hu f’xi dimostrazzjoni. Tridu tiftakru li dawn is-sittax-il sena kienu mmarkati bl-użu tal-vjolenza kull meta deherilhom li hekk hemm bżonn. Ma nistgħux ninsew u nibqgħu nfakkru dak li ġara dan l-aħħar f’pajjiżna. Dak li ġara fi-Żejtun. Ħsara kbira lill-pajjiż. Ħsara kbira mhux biss għax dakinhar sfaw feruti Maltin. Imma ħsara kbira wkoll għax dawn l-affarijiet l-aħbar tagħhom tixxerred ma’ kullimkien. Minħabba dak li għamlu huma tul is-snin pajjiżna ġie mpinġi bħala pajjiż li ma jistax ikollok fiduċja fih. Aħna ma nistgħux ninsew is-sagrifiċċju ta’ Raymond Caruana. Ma nistgħux ninsew li diġà għaddew erba’ xhur mill-qtil ta’ Raymond Caruana u sal-lum aħna, l-poplu Malti, għadna ma nafux, għad ma sarux l-investigazzjonijiet bis-serjetà biex min hu ħati ta’ dan id-delitt faħxi jieħu dak li ħaqqu. Aħna ma nistgħux ma niftakrux. U lil Karmenu Mifsud Bonnici ngħidulu ara l-aġir tagħkom x’qed jagħmel fil-pajjiż. Ma nistgħux ma niftakrux dak li ġara nhar il-Ħadd li għadda kemm fiż-Żebbuġ kif ukoll fir-Rabat. Dawn huma affarijiet li r-responsabbiltà għalihom taqa’ fuqkom. Tul is-snin ma rażżantux il-vjolenza f’pajjiżna. Aħna għall-kuntrarju għamilna appelli wara l-ieħor biex il-firda fil-pajjiż insewwuha. Aħna ilna ħames snin ngħidu kemm kien hawn bżonn l-għaqda fil-pajjiż u dak il-bżonn għadu jikber. Kemm kien hawn bżonn li nsibu l-mod kif il-pajjiż tagħna nerġgħu ngħaqqduh. U din hija l-wegħda tagħna. Dan hu l-programm elettorali li ppreżentjna l-ġimgħa li għaddiet għall-approvazzjoni tal-poplu tagħna. Ħarsu wkoll lejn il-progrmm elettorali tagħhom. Taqrah u nistqarr li ma sibt assolutament xejn fih ġdid. Juri li dawn huma nies li tilfu kull ħerqa, li jnsabu bla ħeġġa. L-unika ħeġġa li għandhom hi biex jżommu l-poter a kwalunkwe kost. Agħmlu paraguni bejn iż-żewġ programmi. Tagħhom programm li jħares lura. Għal darb’oħra jerġgħu jagħtuna l-istorja ta’ kif jifhmuha huma ta’ dak li għadda minnhom pajjiżna, fis-snin sittin, fis-snin għoxrin, u aktar tard. Għax imorru lura sa Manwel Dimech. Hekk hu l-programm tagħhom. U għall-ġejjieni ħlief ftit kliem vojta ma hemm xejn. Qabluhom iż-żewġ programmi u ħarsu lejn il-programm tagħna u taraw kif il-programm tagħna jagħti ħarsa ’l quddiem. Ħarsa ’l quddiem mimlija fiduċja. Ħarsa ’l quddiem mimlija kuraġġ. Ħarsa ’l quddiem fejn ngħidu li dan il-pajjiż żgur se jieħu li għandu bżonn. U l-ewwel li għandu bżonn hu li nerġgħu nsiru lkoll aħwa Maltin. Il-programm tagħna hu mmirat biex insewwu l-firda, biex inneħħu l-mibegħda sabiex dan il-pajjiż jerġa’ jsir pajjiż wieħed. Pajjiż tagħna lkoll għax ilkoll aħwa Maltin. Il-programm tagħna tindunaw li jħares ’l quddiem u jrid l-ewwel nett isewwi l-affarijiet ħżiena li saru tul is-sittax-il sena li għaddew. U saru tant affaijriet ħżiena! Is-sistema tal-edukazzjoni f’pajjiżna li tinsab fi stat ta’ ħerba. Il-Partit Nazzjonalista qed juri l-mod kif l-edukazzjoni f’pajjiżna terġa’ tieħu r-ruħ. Kif iż-żgħażagħ tagħna jerġgħu jiġu ppreparati għall-ħajja, għax-xogħol li għandhom isibu f’pajjiżna fis-snin li ġejjin. Ħarsu lejn il-programm tagħna u qabbluh mal-programm tagħhom għal dak li għandu x’jaqsam mas-saħħa fil-pajjiż. X’għamlu dawn għas-saħħa tal-poplu tagħna? 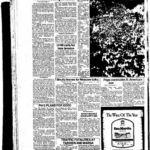 L-ewwel ħaġa li għamlu kienet li fl-1977 keċċew lit-tobba Maltin. Żarmaw sptar u l-istruttura tas-saħħa li kellna fil-pajjiż. F’għaxar snin ma kienux kapaċi jsewwu dik il-firda fost it-tobba li ġabu bl-aġir tagħhom għaxar snin ilu. Alla jbierek jiftaħru li fil-pajjiż għandna sitt polikliniċi. Sitta Alla jbierek. Uħud minnhom bħal dik tal-Mosta kienet diġà mibnija mill-Gvern Nazzjonalista. Irranġawha xi ftti irrid ngħid u tagħti aktar servizzi llum milli forsi kienet tagħti sittax-il sena ilu. Imma żarmaw tant affarijiet. Insejna, pereżempju, li f’kull raħal ta’ Malta kien hemm tabib li kien jissejjaħ id-DMO, id-District Medical Officer, li kien ikollu l-berġa f’kull raħal u belt ta’ Malta. U llum suppost il-poplu ferħan u kuntent għax għandna sitt polikliniċi fil-pajjiż. Ħarsu lejn il-programm tagħhom u taraw li dawn anqas ma kienu kapaċi jwiegħdu servizz ta’ tobba b’xejn għal kulħadd. Għall-kuntrarju, ħarsu lejn il-programm elettorali tagħna. Programm li jiżgura li fil-qasam tas-saħħa jkollna l-koperazzjoni ta’ kulħadd. Nerġgħu nieħdu lura dawk it-tobba li tkeċċew u magħhom insibu l-koperazzjoni tat-tobba kollha. Il-koperazzjoni ta’ min għandu x’jaqsam mal-qasam tas-saħħa biex f’pajjiżna verament ikun hawn servizz tas-saħħa nazzjonali, li biż-żmien jsir ukoll servizz tas-saħħa b’xejn għal kulħadd, li jagħtik id-dritt li tagħżel it-tabib li trid int u s-servizz jingħata b’xejn. Ħarsu lejn il-qasam tal-ekonomija fil-pajjiż. Ħarsu lejn id-diżastru li hawn fil-qasam tax-xogħol. Taqra l-programm tagħhom u ħlief kliem vojt ma ssib xejn. Nerġa’ ngħid, nixfu mill-ideat. Agħmlu l-paragun mal-programm elettorali tagħna. Programm li jrid verament jibni bil-koperazzjoni ta’ kulħadd. Aħna ma nisservewx b’isem il-ħaddiema. Aħna ngħidu għall-ġid tal-poplu tagħna għall-ġid tal-ħaddiem Malti l-ewwel nett hem bżonn il-koperazzjoni ta’ kulħadd. Dan li qed joffri l-programm elettorali tagħna. L-istess irridu nsewwu l-ħsara li saret fil-qasam tar-relazzjonijiet internazzjonali. Tul is-sittax-il sena li għaddew tgħidx ma min dawn ma ġġieldux. Daqqa waħda jgħiru lil Amerikani u l-aħħar waħda li smajt illum hi li issa Karmenu Mifsud Bonnici skopra ‘l għaliex qed ikun hawn il-vjolenza f’pajjiżna. Qal għax hawn infiltrazzjoni tas-CIA. U aħna ngħidulu jekk trid tfittex ir-raġuni tal-vjolenza dur dawra madwarek ikkontrolla lil dawk madwarek u niggarantulek li vjolenza aktar fil-pajjiż ma jkunx hawn. Irridu inneħħu l-ħsara li saret u nibdnu relazzjonijiet internazzjonali li jagħtuna kredibiltà u jagħtuna fiduċja. Meta aħna ngħidu li rridu niksbu il-kondizzjonijiet xierqa biex Malta ssir parti mill-Ewropa ħielsa, aħna nafu x’qed ngħidu. Mhux qed nagħmlu biss għażla għal dak li jirrigwarda l-qasam tal-ekonomija. Anke dik hija għażla li qed nagħmlu u nafu x’qed nagħmlu. Qed ngħid li jekk irridu nippjanaw fil-bogħod, jekk irridu li l-ekonomija tagħna tqum verament fuq saqajha, hemm bżonn li bil-mod il-mod tkun tista’ tikkompeti, ma jkollhiex bżonn aktar il-protezzjoni kollha li għandha llum. Irridu naħsbu fil-bogħod u ngħidu li dik hi għażla tajba fil-qasam tal-ekonomija. Imma l-għażla li nidħlu aħna wkoll fil-Komunità Ewropea hija wkoll għażla politka. Irridu niddikjaraw darba għal dejjem li dan il-pajiż hu pajjiż demokratiku, pajjiż li jgħożż il-ħelsien, pajjiż li ħadd mhu ser jiċħad il-libertà ta kull wieħed u waħda minna. Għalhekk rridu li din tkun linja ċara. Mhux aktar li jiġi xi Prim Ministru u jgħidilna li xi sezzjoni tal-poplu għandha dritt sagrosant li tiggverna. Għandu dritt li jigverna l-poplu Malti skond l-għażla ħielsa u libera tiegħu. Dan għalina jfisser l-għażla li nfittxu t-triq ta’ kif nistgħu nsiru membri sħaħ tal-Komunità Ewropea. Ftakru minn xiex għaddejna; aqraw il-programmi elettorali u araw min verament jistħoqqlu l-vot tagħkom. Aħna rridu npoġġu s-sisien għall-ġejjieni. Il-programm elettorali tagħna qed jgħid x’inhuma, x’irriduhom ikunu dawn is-sisien għall-ġejjieni. U dawn is-sisien għall-ġejjieni aħna ġbarnieh fi tliet kelmiet. Tliet kelmiet li llum huma fuq fomm kulħadd. Is-sisien tal-ġejjieni huma x-xogħol li jkollna f’pajjiżna jekk ikollna gvern għaqli, gvern serju. Is-sisien għall-ġejjieni huma l-ġustizzja. Il-ġustizzja li naqset f’pajjiżna. Is-sisien tal-ġejjieni huma l-libertà ta’ kull wieħed u waħda minna. Għalhekk fil-ftit ġranet li baqa’ komplu stiednu lil kull min tafu biex b’moħħu jaħseb u jara verament hu x’għandu bżonn dan pajjiżna u min verament jista’ jagħti lil pajjiżna is-soluzzjonijiet għall-problemi li għandu. Hekk ser inkomplu nagħmlu fil-ftit ġranet li baqa’. Konvinti li r-rebħa diġà hi tagħna, imma konvinti wkoll li dik ir-rebħa ser inkomplu nkabbruha, biex ikollna verament ix-xogħol, ikollna l-ġustizzja, ikollna l-libertà.